Interests: Family Medicine, Paediatrics, Preventative Medicine, Men’s Health. Consults: Monday, Tuesday and Thursday. Gerard graduated from Monash University in 1981. He spent four years in hospital work at Geelong Hospital and the Royal Children’s during which he gained his Diploma of Obstetrics. 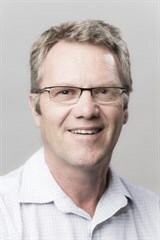 He has been in full time General Practice since 1987 and joined the team at Bluff Road in 1990. Gerard was chairman of the Royal Australian College of General Practitioners (RACGP), Preventative and Community Medicine Committee (Vic) for 10 years. General Practitioners in Eastern Victoria. He is the current Chair of GPSA, the national body for GP Supervisors. Gerard is a fanatical Geelong Cats supporter and in his spare time he likes cycling, walking and playing the guitar.